Dentists have a variety of ways to improve the appearance of a smile. Snap-On Smile is an affordable, non-invasive way to have the celebrity smile you have always wanted. It can do the job of veneers, teeth whitening, dental implant, and/or partial dentures without any needles or drilling. At Newman Family Dentistry, we can give you this life changing dental appliance in just two visits to one of our convenient offices in Indianapolis or Carmel. What exactly is a Snap-On Smile? 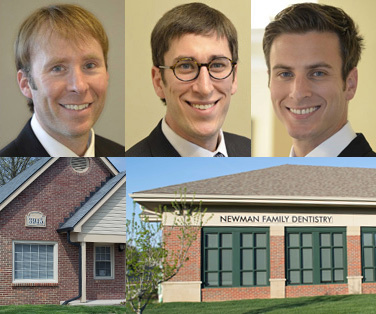 At Newman Family Dentistry we want to provide our patients with as many of the best cosmetic dentistry options as possible. This solution is ideal for anyone who wants a stunning smile without the expense or the pain and inconvenience of other, more invasive procedures. It can be a permanent solution for those who aren't candidates for other options or a temporary solution for those waiting for dental implants to fuse to the jaw. You could be enjoying the confidence that a new smile can bring in less than a month with two easy visits! The first step is to contact us at Newman Family Dentistry and come in for a consultation with one of our Snap-On Smile trained dentists. During your first visit, the dentist will determine if you are a candidate for Snap-On Smile. Then you'll choose from different shades and shapes for your new smile. Finally, the dentist will take a mold of your teeth to ensure a perfect fit. This is a painless process and only takes a few minutes. After a few weeks, we'll get your new dental appliance back from the lab and ask you to come back in. We'll do a final fitting to make sure it's just right, go over care instructions, and you can be on your way, showing off your new smile to everyone you meet. Is Snap-On Smile Right for You? Getting a Snap-On Smile really can make a difference in how others see you and how you feel about yourself, but as with every other option, there are pros and cons. Snap-On Smile is cheaper than most other options, it's completely reversible, and it's painless to get. But it may not last as long as other options either. Any time you have an appliance in your mouth it takes some time to get used to, but in time it begins to feel like your actual teeth and you along with everyone else won't know that they aren't! Drs. Don, Marc, and Mikel would be happy to discuss all your options with you when you come in and the pros and cons of each. We all notice when someone has a beautiful smile. A confident, captivating smile affects more than just what's on the surface. It can make you a happier person. If you cringe when asked to smile for a picture, or cover your mouth when you speak to others, it's time to come in for a consultation. Whether you're ready to move forward with your Snap-On Smile or would like to discuss other cosmetic dentistry options, contact us to schedule an appointment today. We have two convenient locations in Carmel and Indianapolis and we would be delighted to help you.